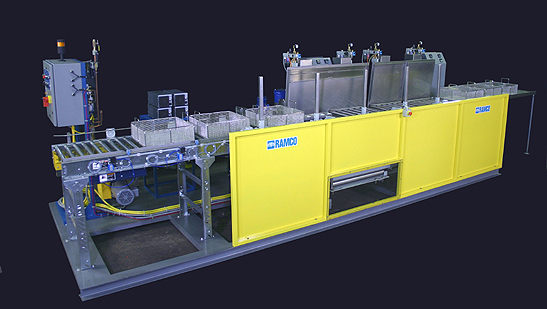 RAMCO Automated Parts Washing Systemsautomatically feed baskets into and through a RAMCO immersion system. 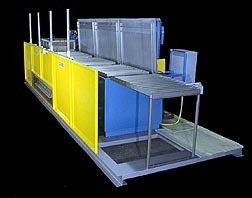 The automation is designed to handle multiple baskets in synchronous transfer. The transfer mechanism consists of a patented articulating walking beam assembly with pneumatic drive and air-over-oil controls. The arms move left and right on Thomson linear bearings over hardened steel shafts and articulate ninety degrees at the beginning and end of each cycle. 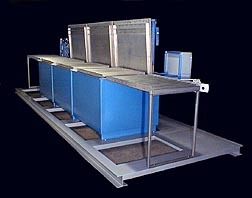 The articulating walking beam assembly has multiple shifting arms corresponding to the number of processing stations. Transfer is accurate and smooth. The automation is PLC controlled and located in a pedestal mounted operator control station conveniently positioned for ease of operation. Controls include run and debug sections, manual and automatic mode selection, interrupt mode and E-stop. 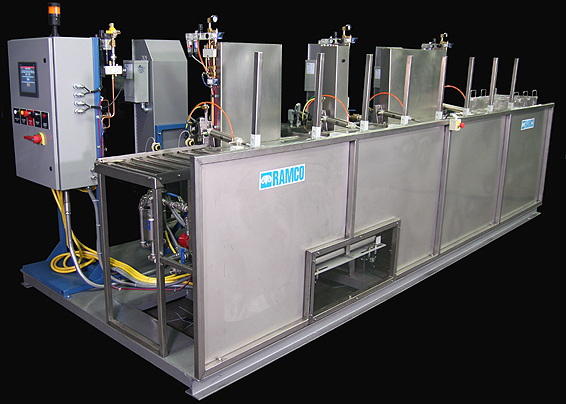 RamTough Automation is the first retrofittable system for immersion parts washers. This patented system allows a manual line to be upgraded to full automation at a later date without any modification to the basic tank line. 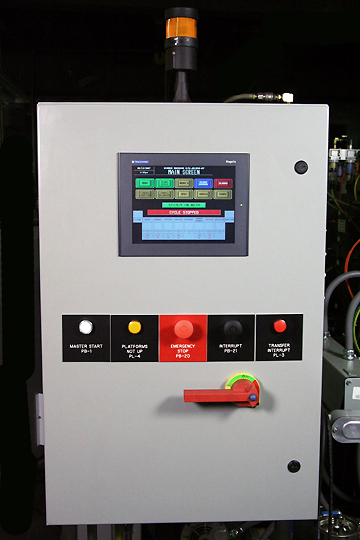 Automation Ready cable receptacles are installed in the control panel(s). Internally all transfer functions are wired to the cable ready receptacles. When you want to automate the articulating walking arm assembly is bolted on and the mating cable connectors plugged in. All transfer functions are now controlled by the automation PLC. It’s as simple as that! Automation Ready is the safest most cost effective way to invest in a system. It gives you the flexibility of grooving in and tailoring your operation before locking into automation. 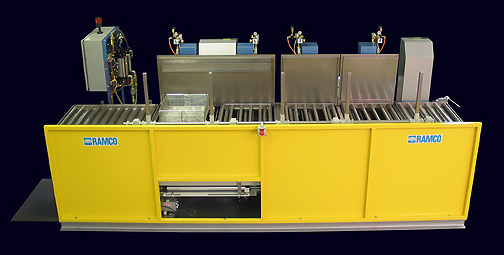 The photo sequence below shows a three tank, 1000 pound capacity, RAMCO immersion washing system consisting of wash, rinse and rust inhibit stations. The tanks are mounted onto a fabricated I beam base. 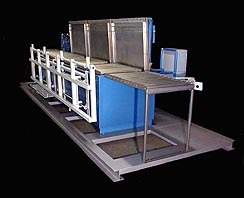 Roller conveyor platforms and load/unload conveyors are added to facilitate transfer between stations. The next photo show the basic walking beam assembly mounted on the tanks. The final photo show the completed system with guard and transfer arms installed, basket and remote operators control pedestal (in the rear at the far end). RamNet is an upgrade of RamTough using an Ethernet network of microprocessors. Each stage has its own microprocessor installed and internally wired to all local devices to power-up and run that stage. The microprocessor controls the timing, sequencing and all solenoids relating to covers, elevators, pumps, ultrasonic generators and heat on/off (temperature can be control locally via digital temperature controllers or through the PLC). Each microprocessor is connected to the adjacent electrical box on the adjacent stage. The entire system, all stages, is daisy-chained together in this way. The main CPU is located in an Operators Control Station. The microprocessors are all linked to the CPU to coordinate much like the way that the human body works (i.e. a central nervous system controlled by a brain). A touch screen, main disconnect switch and CPU with upgradeable chip are all provided in the operators control station. By using computer technology the programming variations and overall flexibility of the system is almost limitless. The operation, sequencing and integration of each stage is independently controlled from the CPU. Only those stages that are processing are sequentially activated. Multiple baskets can be run side by side with different programs. Baskets are recognized (by manual selection or coding) on loading. The program can be designed to sequence individual steps and times for individual baskets at each stage independent of the prior or subsequent stage thereby allowing different recipes to run simultaneously. 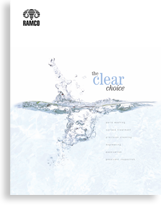 The elimination of multiple timers, counters, relays, cables, connectors, switches, pilot lights, disconnects and related internal wiring results in a more compact and cleaner looking system. By installing upgradable chips programming changes can easily be made.